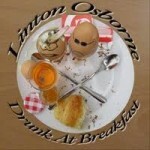 Share the post "Album review: LINTON OSBOURNE – Drunk At Breakfast"
Former Nazareth vocalist Linton Osborne (who has also worked with original Naz guitarist Manny Charlton) has continued to work hard and, amongst a number of projects, has released this rather marvellous album. His work with Nazareth was too short lived, and with them recorded a lot more than the band will officially tell you (and it sounds much better than anyone close to the band will ever give credit for). Other previous work includes Bon The Musical (Edinburgh Fringe) and the more folk oriented albums Ballads & Battles and Pigeonhole. Not only does all this encompass a variety of musical styles, but a great deal of talent too, and given that he’s still going after what happened with Nazareth is a testament to his personal strength too. Working with guitarist Kevin Singer, bassist William Winsborough and drummer Dominic Hardy, what was originally planned as a country album came out reworked as a bit more rocky, and so they cranked it up. Given Linton’s vocal style and higher octave power, it’s come as a natural progression to the Bon Scott project. Opener ‘Turn It Up’ kicks off in a stripped down bluesy metal style, there’s an AC/DC comparison from both the late 70′s and early 80′s. The chords are kept simple but somehow manage to do so much. The guitar on ‘Need It Man’ is old school rock’n’roll with some neat arpeggios thrown in, and the vocals, mid range power, give the rock’n’roll a beefed up 60′s feel. ‘City Of Sin’ is a bit more crash bang wallop – imagine Raven playing r’n’r. There’s a distinct AC/DC swagger to the title track. Again a stripped down feel, a diesel fuel edge to the blues without the boogie. Then all of a sudden Mud takes things lighter, with a 60′s psyche/lounge feel. ‘The Devil Is Strong’ shows another string to the bow, as Linton’s voice ventures on occasion to the lower register, and there’s a touch of Hank Marvin to the guitar, while Revolution Rock nods in a more power metal direction. The album finishes with the country ‘Who Let The Cat Out Of The Bag’ – a very different feel but there’s some fine guitar picking and it suits Linton’s vocals perfectly. Some rock’n’roll and rockabilly thrown in. This entry was posted in ALBUM REVIEWS, ALBUM REVIEWS (Mobile), All Posts and tagged album, blues, Drunk At Breakfast, Linton Osbourne, Nazareth, review, rock, rock 'n' roll, vocalist. Bookmark the permalink.